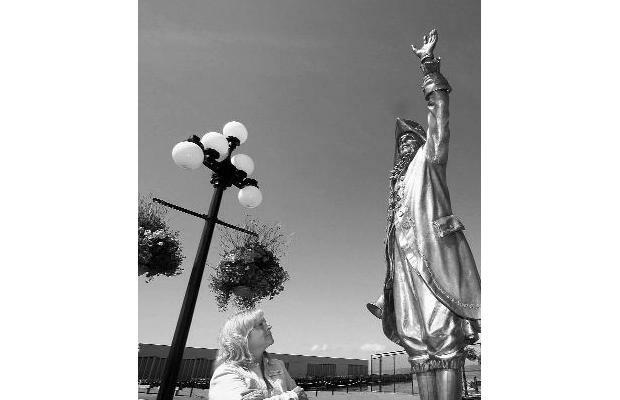 A town crier frozen in a permanent pose of greeting is the latest symbol to welcome visitors to Victoria. The friendly image comes in the form of a bronze statue, erected at Ogden Point through the efforts of the Victoria A.M. Association. Also newly unveiled is an information kiosk detailing key ecosystems on Vancouver Island. The kiosk is the second one installed by the Ogden Point Enhancement Society, which has put close to $750,000 into Ogden Point beautification efforts since its formation in 1996. Ogden Point, located on the James Bay waterfront, is a major transportation hub. It saw a record 210 cruise ships use its docks last year and bring in a combined total of almost 400,000 passengers. The site is owned by the Greater Victoria Harbour Authority. Louise Chabros, president of the volunteer-driven Victoria A.M. Association (so named because its meetings are in the morning), said the idea for the statue came up about a year ago through her acquaintance with artist Armando Barbon of Studio 37. "We launched the project publicly last September and began our fundraising," she said, adding that the project marks the association's 25th anniversary. Barbon donated the statue, but fundraising is needed to pay for the bronzing of the piece, Chabros said. About $15,000 of the $50,000 cost has been collected. Chabros said the town-crier statue is life-sized and based on the venerable Tommy Mayne, a town crier and longtime Victoria A.M. volunteer who has been with the group for 19 years. "The statue is created in his likeness, but it's been dedicated to the tradition of town crying." Seven local town criers were on hand for the dedication. "Town criers have always been the heralders of news and readers of town proclamations, and many of our local municipalities still use the town crier," Chabros said. "We do, as well, when we can get them down to the ships. They give the passengers a welcome while they're pulling into the port." She said it's all part of the association's mandate -- to promote and enhance tourism in Greater Victoria. 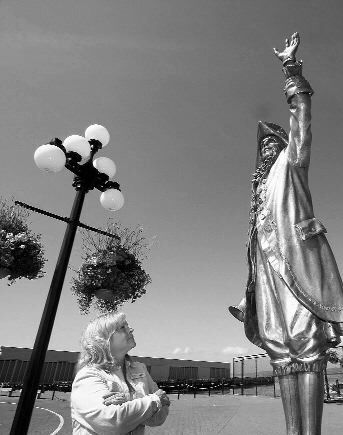 To donate to the statue project, call the Victoria A.M. Association at 250-381-1611 or Chabros at 250-589-5359. Foliage has given way to footwear at the Superior Café. A dead tree in the café's courtyard has been turned into the Make A Wish Tree by café staff intent on doing something creative and community-oriented. The tree has had other adornments in the past, but the Superior's Jamie Gegeny said it started taking on its current form a few months ago. The idea is that customers bring a pair of lace-up shoes to the Superior Street eatery, or get one from the basket of shoes beneath the tree, and toss it over a branch. They also get to make a wish as they do it. "Looking at it, I would say there's probably about 300 pairs," Gegeny said. "And more to come." The cost of hanging a pair of shoes is a donation to the Women in Need Community Co-operative, a not-for-profit organization operating a number of resale stores that help fund services for women. Transition from abusive relationships to independent living, training and employment programs, and bursary opportunities are some of the services WIN offers. WIN executive director Clare Yazganoglu said she was delighted with the "shoe tree" idea when contacted by the café. WIN is the ideal partner, since it collects used clothing, including shoes, for its stores. "They asked 'Can you keep aside running shoes for us?' We've been doing that and people have been making donations, so it's been great. I think people are having fun doing it, too." The shoes, mostly pairs and the odd single that WIN has been unable to sell, are picked up by the Superior's Lisa Boehme. She said the Make A Wish Tree is based on a Dutch tradition, where parents will put a pair of baby shoes in a designated tree in their village or town when their baby is born. "So I thought all the people that come to Victoria and people that come here to the Superior Café might as well throw some shoes and leave some money for Women in Need. I really like it. It makes me smile to think that somebody walked in those shoes. "I think the thing that's really lovely is there's spotlights underneath the tree and at night it looks like giant butterflies in it." Boehme said she loves the idea of so many people being involved in the effort. "It's good when communities do things like this, and we can help each other." The money raised is going to WIN's self-sufficiency fund, Yazganoglu said. She said the fund helps women pursue training, self-development courses "or anything that's particularly useful for them in terms of moving forward in their lives." Victoria's Lisa McBain decided a challenging adventure was in order when she turned 40. So the long-time outdoor enthusiast signed up for the B.C. Bike Race, a seven-day mountain-bike event that takes riders from Vancouver to Whistler. Along the way, she will be promoting and raising funds for one of her favourite causes -- the Power To Be Adventure Therapy Society. Power To Be helps youth of all abilities and backgrounds enjoy the benefits of outdoor education. McBain's supporters for the race include Trek Bicycle Store/Pro City Racing of Victoria. She has been working with Trek to start up a mountain-bike program for Power to Be, and will be using the money she collects to further that effort. The B.C. Bike Race starts today and wraps up next Saturday. To support McBain, go to bcbikerace.com, where she is listed as the Power To Be team in the "solo open women" category. Four Victoria schools wrapped up the academic year by earning provincial awards for their recycling efforts. High schools and elementary schools from around B.C. were grouped by size to compete in the collection of recyclable drink containers. The contest was sponsored by Encorp Pacific, a not-for-profit corporation committed to recycling and the development of recycling systems. Topping their categories were View Royal and Rogers elementaries. Both schools received $1,500 in prize money from Encorp Pacific and the Bottle Depot. For View Royal it was a second straight No. 1 finish, with the school collecting 131,509 containers since last September. Spectrum Community School was a second-place finisher and took home $1,000, while Glanford Middle School was third in its division and picked up $500. The Bottle Depot, with three Greater Victoria locations, has been active in school recycling efforts for some time, and provides pick-up service for both schools and community groups. Overall, Encorp Pacific's 2008-09 school recycling program in B.C. saw more than five million containers collected and $317,000 in funds distributed among the schools taking part.